Watch this for thirty seconds and tell me what immediately comes to mind. Can you say “Katniss?” Just trade Meryl Streep for Donald Sutherland and throw in a few mockingjays. The guy who plays Jonas even looks like his last name should be Hutcherson-Hemsworth! When I heard Hollywood was making a film adaptation of The Giver, my reaction was part excitement but far more fear. Why? Because as I explain on The Love of a Good Book this week, The Giver is sacred. I’ve read Lois Lowry’s masterpiece three times so far and worn my copy to the bone. (The picture at right can attest to this, though I blame the torn cover on my brothers!) The first time, I was probably about twelve years old. And while I enjoyed the story about the colorless, dystopian world that assigned marriages and careers like theatre seats, I only understood a fraction of what I would five years down the road … and again four years after that. Assigned to read it once in middle school, once in high school, and once in college, you might think I’d be bored of the story by now. But that couldn’t be further from the truth. Instead, I’ve always reached “the end” amazed that I missed so much in the past. The story seems to be constantly evolving–revealing new connections and emotions and “ah” moments depending on my current state of mind or stage in life. To me, that is the sign of a really phenomenal book. Yes, it is written in a way that resonates with its young adult audience. It encourages them to ask questions about freedom, love, and how much suffering those two things are worth. But there is so much more going on. There are far more sophisticated statements about government, euthanasia, morality, what it means to be human, and the extent to which we ignore crimes against humanity for the sake of some “greater good.” In grade school, the book was a finger painting. In high school, it was a Monet. Now, it’s the ceiling of the Sistine Chapel, which can be examined for hours and still not fully appreciated. So even with a master like Jeff Bridges in the title role, nothing can possibly replace the Newbery Medal winning book. After all, the best thing about The Giver is the way in which it comes together in each reader’s unique mind. The film only shows how it came together in one. 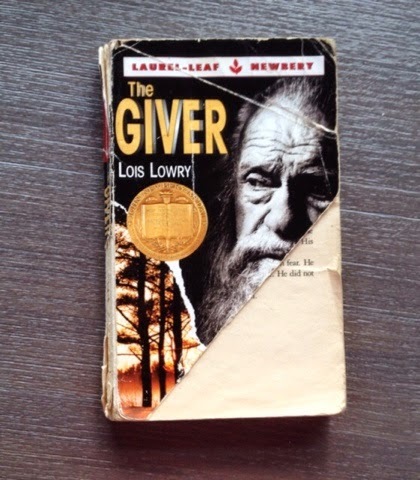 I have read The Giver over a dozen times–sharing the book with a new group of seventh graders each year. Once I saw the trailer on TV my heart broke. Some books speak to you on multiple levels, and those messages cannot be conveyed by a movie. I just hope I can convince my students that the book is worth the time invested in reading it.